As our Conference honors vision and leadership, it is a great privilege to start the ceremony honoring one of the greatest leaders of our time, Dr Henry Alfred Kissinger. Dr Kissinger was supposed to be on this stage today with us. For last minute reason and at his profound regret couldn’t travel to Israel but in a few minutes he will be on live with us by video conference. 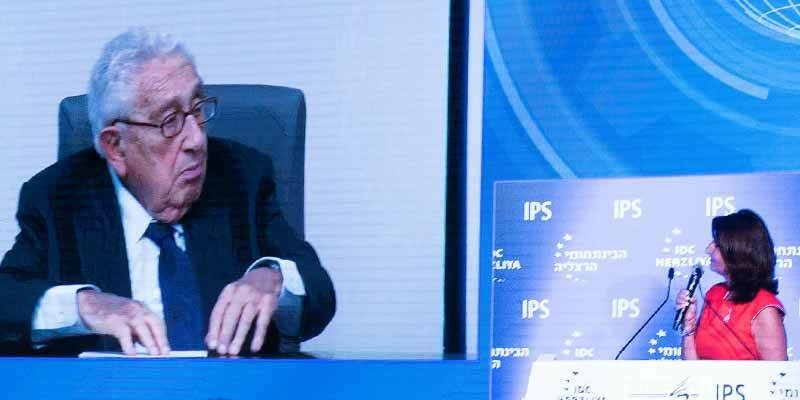 It is an historic moment as It has been a long time Dr Kissinger did not address directly the Israeli public. We will start the video conference and I will ask to welcome for this very special moment Dr Henry Kissinger. 56th secretary of state, Peace Nobel Prize in 1973, Dr Kissinger is a statesman, that had to confront his all life, the realities of power and war. “ The task of a leader is to get his people from where they are to where they have never been ”. A quote that should be source of inspiration for leaders of all times. A thinker, a writer, a provocateur of his time, and a great lover of life. In extraordinary difficult times, marked by political upheavals and the Vietnam War, Doctor Kissinger’s masterful diplomacy restored American power during the Cold War. The opening to China not only divided the communist world, it also allowed today the world’s fastest growing economy to break its isolation, open its economy and lift hundreds of millions out of poverty. As Secretary of State and National Security Adviser during the Kippur War in 1973, he ensured the airlift that supported Israel and allowed the genius of its military leaders to overcome the attack of its Arab neighbors. His role during the cease fire between Israel and Egypt cemented Egypt’s relation with the United States, paving the way to the strategic peace agreements between Israel and Egypt one of the most strategic asset of Israel security. But when honoring Doctor Kissinger, it is no only one of the 20thCentury greatest diplomat and statesman we look up to. It is also the visionary thinker applying History’s lessons to the challenges of times to come. At Harvard University, Doctor Kissinger wrote his History dissertation on the Congress of Vienna, when diplomats like Metternich, Talleyrand and Castlereagh had to rebuild the European system after the Napoleonic wars. The lessons of the previous century are critical in understanding our own time. How to find peace and stability in the face of revolutionary powers, radical islam and populism? What role should great powers, like the United States play to prevent anarchy and violence? These questions have sustained Doctor Kissinger’s thinking and actions that are taking roots in his own history . Born in Germany in at the age of 15, in 1938 he leaves Nazi Germany with his family to find refuge in the United States. The collapse of the international system under extremist forces is not an abstract notion for you, Doctor Kissinger. In his last book, World Order, a fascinating reflection on the challenges of today’s international relations, Doctor Kissinger warns against the erosion of an international system based on common norms and rules. I should note, breaking in a conference celebrating innovation and technological progress that in your book, you warn about the new information age, based on quick thoughts, and digital democracy. In your book, you wonder about the future of leadership in an age of instantaneity, the ability to stay the course with a vision in the constant media cycle. How can we make decision without putting them in historic perspective? You ask how an objective notion of truth can survive tailor made content, individualized research results online. Alongside the shift in the geopolitical environment, all these factors conspire to undermine the common foundations of the international system. The rise of revisionist powers in the Middle East like ISIS and Iran, the crisis in Europe, the emergence of China, the multiplication of new media and technologies. result “not only a multipolarity of powers, but a world of increasingly contradictory realities”. What does this mean for Israel in its strategic environment? What does it mean for a European continent that is confronted to the return of violence, terrorism and populism? For the United States, tempted once again by the specter of isolationism? German sociologist Max Weber said political leaders must have passion, responsibility and a glance. Your glance Dr Kissinger, is a mix of vision and sense of proportion, an ability to understand confusing times before others and lead the way. As great statesmen like Richelieu or Metternich who guided their countries through blurred times: wars of religion, periods of transition and revolutions. Your visions and actions have transformed the 20th century. We live in complicated times, this is why we all feel priviledge to listen to your vision of the world challenges and your advises to Israel. That call for a new Richelieu, a new Metternich, a new Kissinger.